An innovative and affordable flight training software built on the real world physics of drone flight. Designed for both new and veteran drone pilots, droneSim Pro will help you learn the basics and expand your capabilities in flying drones. We've brought drone training to a whole new level! It's a great way to "log hours"
#1 Choice by Dronethusiast.com! Windows and Mac compatible. Use your own drone controller (with a dongle attachment, not included). Use your own USB controller! Compatible with XBox, Playstation, Logitec, and more! droneSim Pro can be customized to meet your unique training needs. Whether you need to practice flying a drone in a specific public safety scenario, or to inspect powerlines, or to film outdoor weddings, our team of simulation experts can re-create any environment or situation according to your specific needs. Excellent training for FAA Certification and pre/new drone operators. Aircraft motors reflect performance of the real motors! The drone will handle and respond in the same way the real one does. Practice before flying (and crashing!) the real thing. Warnings for loss of vision/link of sight and altitude restriction. Ready Copters: "Great Educational Drone Simulator"
droneSim Pro can be customized to meet your unique training needs. Whether you need to practice flying a drone in a specific public safety scenario, or to inspect powerlines, or to film outdoor weddings, our team of simulation experts can re-create any environment or situation according to your specific needs. Below are just a few examples of scenarios we can create. Fill out the form on this page for more information. What are the flight controls available? 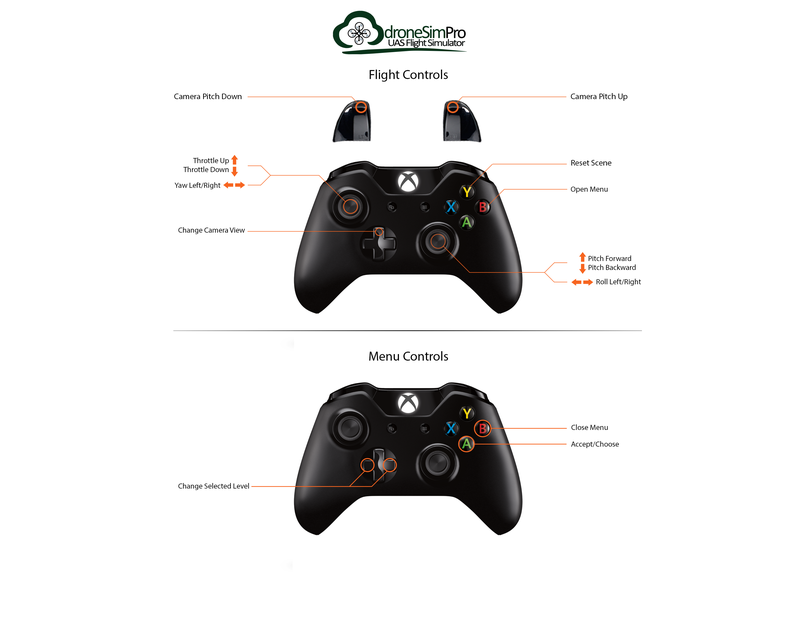 Here are the controls available on the Xbox controller. They are similar for all the devices. What USB controllers are supported? What keyboard controls are available? How realistic are the flight controls? The model was built using real world physics incorporated in to the simulator engine. The aircraft motors reflect the actual performance of the real motors. The drone will handle and respond in the same way the real one does. What happens when new aircraft or scenarios are added? Through the end of 2016, new aircraft and scenarios will be added to the existing package free-of-charge. This will require a new download, but the existing license will work with these additions. How do I use my PS3 controller on Windows? Read this file for instructions on how to install the drivers needed to use the PS3 controller. How do I use my Xbox controller on a Mac? To use an Xbox controller on a Mac requires a 3rd party driver. We had have success with the one from Tattiebogle.net. What do I do if I lost my license key? You can go to the lost license page and request your license be emailed to you again.